2011 has truly been a whirlwind of a year … I had to take a peek back at my 2011 resolutions. Well, I did OK on some parts. 1. I did keep running ~ 428 ish miles this year and I ran two half’s with a new PR of 2:09, a 5 miler, 5k, and 10k too. 2. Simplify/less stress. Hmmmm, not so sure if I accomplished this one. 3. Something just for me. Does President of the Junior League count? The bikram yoga or photography classes sure didn’t happen. 4. Job that I love. Still trying – have a good contract job now, but it will end in Feb. sigh. Maybe I’m not meant to work … too bad that income thing gets in the way. 5. Better mommy/wife/friend – I think I’m batting about a 50/50 here and it depends on the day. I think the word busy sums up 2011. I truly don’t know what happened to the month of November and I keep trying to remind myself to slow down, breathe, and enjoy, but it doesn’t always happen. Our overall job situation was iffy. And stressful. And frustrating. Hopeful for new beginnings in 2012 on that part. So, looking ahead to 2012. 1. Run a marathon. Ok, so there it is. In print. On the internet. Here goes nothing. 2. Run a 2:05 half marathon. Can I just repeat #’s 2-5 for this year? Possibly add a “figure out what the heck to do with this blog” resolution. Running? Toddlers? I don’t talk as much about love or Labradors anymore. The big dogs are still around and still enjoying snacking off low tables, cleaning the floors after dinner, sunbaths, and belly rubs. Looking forward to continuing to declutter/de-Christmasfy the house. I have 4 trash bags ready to take to the Bargain Box thrift store and hoping to tackle the tree and decorations tomorrow. So, here’s to 2012! Happy New Year! Bring on 2012. Kelly tagged me recently and the deal is that you had to list 11 random facts, answer 11 questions, and then make up 11 questions, and tag 11 people. Well, reading all of that wore me out, so I am cheating a bit and will just answer the questions she asked. 11 questions I am asking you! 1. What is your favorite food? Oh so many. Cheese, salmon, a good salad, crabcakes, twice-baked potatoes, steak, flourless chocolate cake, e Can I just answer yes to this question? 2. Coke or Pepsi? Really neither – I rarely drink sodas. When I do, it would probably be a diet Coke. 3. Where did you go on your FIRST airplane ride? When I was in 2nd grade or so, to Cleveland, OH for my cousin’s wedding. 4. Favorite Christmas/Holiday tradition? Attending our Candlelight Christmas Eve service, then driving through a local neighborhood to see their amazing Christmas lights. 6. Are you a morning or night person? Morning person, but more by habit, force, and coffee. 7. If you work, and went to college, is your profession in the same field as your major? Actually, yes. 8. What is your favorite state you have visited or lived in? Why? 9. If you won $1000 from a scratch off lottery ticket, what would you do with it? I would love to say something fun, but that $1000 would go to the regular ol’ monthly bills. 11. What was your first car? VW Rabbit nicknamed “Bucky” since I learned to drive a stick using it. Long story, but my cousin recently shipped us an artificial tree that she was no longer using. We are “real tree” people, so I knew that we wouldn’t use it this year, since we had already put up our tree, so I planned to store it. My parents arrived and we decided that it might be pretty to put it up in our living room, especially since you can see that room from our street. Mom pulled out the old school colored lights (small and large) and went to town. 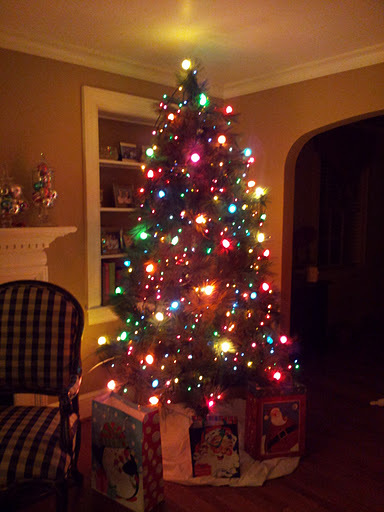 We didn’t use any ornaments, but the tree just gives off a soft glow. Sigh. I really do love this time of year … just wish that we all had time to slow down and enjoy it – a lesson I am trying to learn.